The US launched an airstrike inside of Pakistan’s tribal areas early Saturday morning, ending a 24-day lull in attacks against Taliban and al Qaeda networks inside Pakistan. An unmanned US Predator strike aircraft fired two missiles into a compound of a Taliban commander based in the town of Malik Khel in the Ladha region of the Taliban-controlled tribal agency of South Waziristan. Twenty-five extremists, most of them from Uzbekistan, were killed in the strike, a senior Taliban leader told Reuters. “Our people have informed us that at least 25 people were killed,” the Taliban official said.”It could be more. Most of them are Uzbek mujahideen.” The al Qaeda-affiliated Islamic Movement of Uzbekistan, commanded by Tahir Yuldashev, operates in South Waziristan. 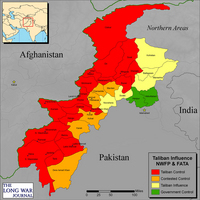 Ladha is in the eastern half of South Waziristan in a region controlled by Pakistani Taliban leader Baitullah Mehsud. There were at least two other strikes in Baitullah’s territory in South Waziristan during 2007, and another strike this year. Today’s strike is the fifth attack this year and the first since Jan. 23, when US Predators conducted attacks in North and South Waziristan. The Jan. 23 attacks took place just two days after President Barack Obama took office. The airstrike in South Waziristan is also the first since Senator Dianne Feinstein, the chairwoman of the Senate Intelligence Committee, disclosed that the CIA was operating a covert air base that is used to conduct the attacks inside of Pakistan. “As I understand it, these are flown out of a Pakistani base,” Feinstein said after brushing off criticism and protests over the attacks. Senator Feinstein’s spokesman later claimed she was referring to a February 2008 report in the Washington Post. In September 2006, the Asia Times reported the US was operating a secret base in Tarbella, a region 12 miles outside of Islamabad. Senior officials in Pakistan’s government and military, including the president, the prime minister, and the Army chief of staff, have repeatedly protested US airstrikes inside the tribal areas as violations of the country’s sovereignty. The disclosure of the base puts the Pakistani officials in a difficult situation with the citizens of Pakistan. US intelligence believes al Qaeda has reconstituted its external operations network in Pakistan’s lawless, Taliban-controlled tribal areas. This network is tasked with hitting targets in the West, India, and elsewhere. The US has struck at these external cells using unmanned Predator aircraft and other means in an effort to disrupt al Qaeda’s external network and decapitate the leadership. In 2009, US strikes have killed two senior, long-time al Qaeda leaders. Osama al Kini and his senior aide, Sheikh Ahmed Salim Swedan were killed in a New Years Day strike in South Waziristan. Kini was al Qaeda operations chief in Pakistan. Both men were behind the 1998 bombings of the US embassies in Dar es Salaam, Tanzania and Nairobi, Kenya, which killed 224 civilians and wounded more than 5,000 others. 25!!!! Wow they hit the jackpot. What is with Sen. Feinstein? Is this absolute stupidity/slipup/arrogance – or – what? Congress just has to be the worst group of fools in the country. They demand accoutability for everthing, while avoiding all responsibility, and can’t even do the simpliest things. Such as not widely publicing the fact that we’re blasting jihadist from bases in the land of the pure. What do you expect from a SF mayor? Can’t we fire them all? It’s good to hear that the Messiah hasn’t put the breaks on the justice by Hellfire program. Bill: Syed also mentions the airstrips in an article in the Asia times 10/11/08, and there was another article on them in either WaPo or WaTimes in March. I’m pretty sure I’ve also seen them mentioned in the Pakistan press in the past, but with the archive search functions at the papers there so weak I”m having a hard time finding them. This is good news, but I have to scratch my head over Tahir Yuldashev — definitely a baddie but there are certainly bigger fish out there. Somewhere in the past I read that the U.S. is only interested in striking al-Qaeda in these missile attacks. They aren’t interested in the Taliban and view them as Pakistan’s problem. If that’s true, then maybe this is a clue. Two Arabs, some other taliban and a number of Uzbeks were killed in the strike, the latest in a series of such attacks which have drawn strong protest from Pakistan. Also, the casualty count grows. More than 30 bodies have been recovered from the rubbles. A senior Taliban leader told British news agency deceased are the members of Al Qaeda and majority of them belonged to Uzbekistan. If my geography is correct, Ladha lies on the main road between south and north Waziristan. You can follow this road from Wana in the south; up a north-south running river valley past Ladha; than further north up another river valley past Razmak; than even further north through a jumble of mountains to the Miramshah area. This appears to be the primary north-south transit road through the Taliban controlled area. If you type in Ladha, Pakistan on Google Earth, you will get B and C markers on either side of the river. I believe the C marker is at the location of the now abandon military check-point overlooking a bridge (32 33 53N, 69 50 00E). That location appears to be the best choke point along the river valley. This is one of those times where I’m glad to have been wrong. I just love those predators. GOOD WORK TROOPS!!! Pity more of those al Qaeda operatives weren’t attending the same party when the missile hit. This is a good day for us, the good guys. Is that a fact? Or is it the non-disclosure by the Pak govt to its own citizens that puts them in a difficult situation? Is it their own lies that puts them in a difficult situation? Is it their own inability to communicate with their own people of their presidents stated intention to carry the writ of law across the land of the pure?! Or is it that the ISI wants to play on both sides of the fence that puts the Pak “officials”, whoever they are, in a difficult situation? Is it a state secret that they are at war with the taliban, leave alone AQ? Is it a state secret that the USA is their ally? Does the common man in Peshawar or Swat, leave aside Punjab want the Taliban so that they can stop sending their children to school and enjoying their music? Afghanistan may be the narco-state, but Islamabad seems to be getting more than a whiff of it. It is time that the Pak govt went straight with its people. It is time that they turned their War of Words internally and stopped crying like a victim. May Hellfire rain on those who wish to be martyred and take them directly to heaven, without them having to go via New york, London, Madrid, Bombay or, for that matter, even Islamabad or Kabul. Thank you Bill, and thank you for all the clarity you bring through your rigour. A vote of thanks is also due to Senator Feinstein for nudging them to be real, wittingly or unwittingly, it does not matter. The ISI may have the greatest need for a reality check. They think they can control the Taliban and Al Qaeda. Not likely! Not only will the Taliban bite the hand that feeds it, they’ll keep nibbling right up to the arm pits. It was hugely relieving to find the actual NEWS about the strike at LWJ. The Pakistanis are not the only ones kept in the dark by their government and media. While we suspiciously scrutinize U.S military reports as biased, our “news” is run through the “spin cycle” and language is filtered with words like “fighters” “victims”: “Taliban fighters take away victims”. We read “facts” that “the vast majority of victims are civilians”. Then we’re fed statements by Pakistan’s Interior Ministry Chief, “The government is doing everything possible to stop [predator attacks] and I hope that America listens to the voice of the people of Pakistan”. I agree with the comments above. P-stan should stop whining about US airstrikes and tell thier people they are in a fight to save thier “nation”…I use that term sarcastically coz there is the civilian gov., and the military gov., the ones with the guns always have the power. As far as Sen. Feinstien goes, this story was leaked a long time ago, by the Middle East Times, who named the town where this base is. Neo is very close with his co-ordinates, and I bet the T-ban/AQ know about it. In any event, the Pak army looks demoralized and scared, running from a battle where they had armor and air-support. They just don’t believe in thier own cause. P-stan will be overrun by these islamic groups sooner, rather than later, and that is scary as hell. Good work Bill, Godspeed. How come there is never a follow-on strike? I read somewhere that after the strike Tban/AQ supporters rushed to the scene to recover bodies..again, why no follow-on strike when they gather…seems fair to me. Feinstein definitely needs to be removed. Our congress is so quick to call for legal action against our troops trying to survive, yet at the same time want to give up secret info so they look cool to their traitor reporter friends…I don’t care if it was revealed previously by other press…she is on the Intel Committee and should be immediately stripped of ANY security clearance!!! I agree whole heartedly with Hodad. People like Feinstein are just as much a threat to national security as AQ/Taliban……….